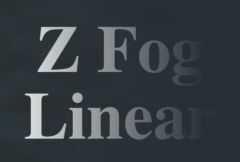 Mixes a fog color into the source clip using depth values from a ZBuffer input. The fog amount varies linearly between Fog Near and Fog Far depending on the depth. Fog Far: Default: 0.8, Range: 0 to 1.